Yes, marijuana is addictive. More about marijuana’s main addictive ingredients and marijuana addiction here. YES. 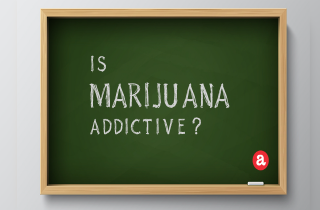 Marijuana can be addictive, although less than 10% of smokers go on to develop an addiction. So how exactly do people become addicted to marijuana – is it based on how marijuana works in the brain? How do you know if you have a marijuana addiction? And is it possible to stop smoking weed without withdrawal? We’ll review these questions here. And at the end, we invite your questions about the addictive potential of marijuana or about general marijuana use. We try to answer all questions personally and promptly. Marijuana is used in a few states as a medicinal treatment for various chronic conditions, including depression and nausea from chemotherapy. In these jurisdictions, marijuana is treated similarly to prescription drugs, legal only to use under a doctor’s supervision. However, as a substance, marijuana us still illegal on the federal level and considered a Schedule I drug – illegal to own or use. What is marijuana made of? Marijuana is a naturally-growing plant. Typically, the stems, seeds, leaves, or buds of the plant are shredded and then smoked. Marijuana is also sometimes ingested cooked into food, or brewed into a tea. The chemical THC is contained in the plant, and it’s what causes psychoactive effects of euphoria when marijuana is used. Marijuana is not as addictive as many other drugs. Only 9% of users develop a physical dependence on the drug. Using marijuana on a daily basis raises the risk of addiction considerably, with anywhere from 25-50% of daily users addicted. Furthermore, using marijuana at a young age (in the teen years) also increases the risk of addiction. For casual users of the drug who don’t have a daily habit, marijuana is not as likely to cause an addiction or dependence, although temporary memory loss on weed can affect you. How do you get addicted to marijuana? Do you still have questions about marijuana addiction potential? Please leave them here. We are happy to help answer your questions personally and promptly. If we do not know the answer to your particular question, we will refer you to someone who does. Weed is a herb .its not a drug at all as far as I’m concerned.the goverment labeled it a drug .i smoke medical weed and also grow hydroponic weed .its medicine to me .and its not gonna get u addicted like opiates benzodiazepines.god put it here for us to use freely . I’m not going to claim that weed is not addictive because it really just depends on your usage, and they very reason you are using it. But i would like to say that it is an excellent way to help a lot of people, and improve their psychological state, and should be used responsibly, and suddenly addiction is no longer a problem. Be reasonable with your usage, and please if you need help, don’t hesitate to talk to someone, because addiction is a problem whenever you realize it, just know, you never have to deal with it alone. For god sake Marijuana is not addictive. It only defends to the user on how they will use it. Just use it in moderation. I’m sorry to say this but Its not that bad kicking pot. People who whine and complain about how hard it is are a bunch of sissys. And its not hard to use in moderation I just don’t get how I hear stories about how pot has ruined people. Try kicking h or tweak that’s hell. Pot saved my life it helped me get clean off hard drugs I have a good job now and I’m happy I smoke pot frequently. When I notice I am smoking to much I take a break for a week to a month. People who blame laziness and stupidity on pot were lazy and stupid before they started smoking. Hi my names Kate. Weed has taken over my life, I have to have it everyday. I been smoking everyday since I was 15. I am 21 now, I never thought it was an addiction. After a long period of time, it can be. I’m thinking rehab. Hello Rusty. I’d say that it’s the association between hanging out and weed that’s making you crave it. Routines are the hardest ones to break when dealing with a behavior you want to quit. I remember my friend was quitting smoking cigarettes, but had the hardest time not to smoke in the morning with her coffee and after eating food, since she always loved doing it. Maybe you can find some other things that interest you and enjoy doing it. This will keep you occupied and plus you may make some new friends. I smoked weed occasionaly for a few months, but then over winter break I smoked at least twice a day for over a month. Now it has hardly been three weeks since I’ve stopped and it seems as though its been months since I’ve smoked and every time I get in the car and listen to music or eat munchy food, I crave weed and think how much better it would be if I were high. I can’t tell if I miss being with my friends (while we are always high, but now they’re away at school) or if I actually miss being high can you give some advice? Hello Juelz. Thanks for sharing your opinion. In reality, marijuana can trigger panic, paranoia, or acute psychosis. While these episodes are more common in new users of for people already diagnosed with psychiatric disorders…the difference between toxicity and healing for any chemical is related to dosage. Some people simply should not be taking marijuana. And marijuana is addictive. While physical dependence is not as extreme in cases of opiate addiction, marijuana withdrawal syndrome is a documented clinical event. Many “Chocolate” bars infact, contain very little cocoa, and its likely that the addiction to chocolate is based on Sugar, habitual form and of course, the aroma it brings. Cannabis and Cocoa work very similar in how they reward the brain. Yes, Cannabis can be addictive, especially if used in a habitual form, but again, its none toxic, and believed to have many theraputic properties. If someone decided to consume Cannabis everyday, there would be very litte health risks to the individual, compared to Alcohol, and many other Drugs. Cannabis withdrawal isnt physical, but mental, due to the habit forming that it poses. Sure, if you took a drug that was non-toxic and heightened your sense, it would be addictive, to a degree. Addiction is based on alot of things, look at smoking cigerettes. The whirl of smoke, deep breaths and shoving in the mouth paired with ammonia infused Tobacco, deadly. The lowdown is.. Cannabis is addictive as anything that is “habit forming” like drinking a soft drink, eating fatty foods and having a strong coffee, but Cannabis is non-toxic, thats the huge difference. Let me begin by saying that my definition of physical dependence did in fact come from the Diagnostic and Statistical Manual of Mental Disorders, Ed. 4, Text Revision (DSM-IV-TR), together with my studies towards a degree in counseling with an emphasis on chemical addictions and substance abuse. Your comments however, do raise a point requiring further discussion as regards â€œaddiction to chocolateâ€. Before I address that idea though let me first say that nowhere in my post did I use the term â€œaddictionâ€. There are two reasons for this. First, it removes the negative connotation usually associated with the term â€œaddictionâ€, and second, by using the term â€œphysical dependenceâ€ I was attempting to concisely convey the idea that there is an actual physical need for that substance. None of this however is meant to say that the term addiction should never be used. Rather, it is simply a cautionary note that we should exercise some care in its usage. As regards your comment â€œaddiction to chocolateâ€ there may be much to that comment than many would realize. For example, the psychoactive ingredient in chocolate (theobromine) is an alkaloid very similar in chemical composition to caffeine and both are considered to be mild central nervous system (CNS) stimulants. While it is highly doubtful that one can become physically dependent on either of these substances, we probable all know one or more persons who have a psychological dependence on them. Loosely stated, psychological dependence is a state in which the thing or substance is used for the reinforcement it provides. If one Googleâ€™s the term â€œpsychological reinforcementâ€ they will be completely amazed at what comes back. The science of addictionology is far too great and encompasses numerous disciplines (e.g., psychology, neurobiology, physiology, and more), for us to rely upon this or that, black or white, and especially good or bad assumptive evaluations. Hi Derek. Actually, the definition presented above comes from medical literature and the Diagnostic and Statistical Manual of Mental Disorders, a guide created by a board of psychiatrists who have been treating addiction for decades. And yes, you can also be diagnosed with compulsive tendencies towards eating chocolate. very irresponsible..your definition of addiction is twisted..under this definition, 20% of the population is addicted to chocolate. There seems to be little doubt that one can become psychologically dependent on marijuana, and for many years it was thought that marijuana use did not result in physical dependence. Most of the thinking surrounding the question of whether marijuana could result in physical dependence centered on the two accepted criteria that define physical dependence (e.g., tolerance and withdrawal). These questions are far from being completely resolved. However, there is recent objective research that suggests a) that over time continued use of marijuana can result in tolerance, and b), surprisingly, that habitual use of marijuana can result in physical withdrawal syndrome. To test this hypothesis, researchers gave lab rats fixed doses of delta 9 tetrahydracannabinol (THC), the primary psychoactive ingredient in cannabis over a fixed period of time. Upon administration of a THC antagonist a significant portion of subjects went into withdrawal syndrome. THC is lipid (fat) soluble, and depending upon the frequency of use THC can remain in the body and active for extended periods of time. It is not unheard of for habitual marijuana users to test positive for active metabolites 30 days after discontinuing use. It is because marijuana can remain active and in the body for prolonged periods of time which may explain why physical withdrawal syndrome is not readily observed. Hi Eddie. We agree. Marijuana addiction can be considered “less insidious” than other harder drugs, but the negative effects of drug addiction are the same, no matter the substance. I was addicted to marijuana among other things. I got clean and sober with the help of a structured sober living and think that marijuana addiction is something that is underrated and talked little about.